Finally! The long wait for the Samsung Galaxy S II has come to an end, almost! The latest news is that it will be announced in August and Samsung has already put up a signup page for the smartphone. 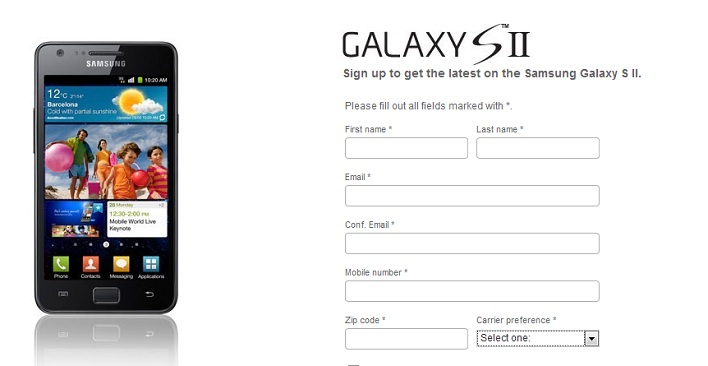 The Samsung Galaxy S II signup page asks for the usual information like name and e-mail but when you hit the carrier preference button, you get these options: AT&T, Cellular South, MetroPCS, Sprint, T-Mobile, US Cellular and Verizon. That doesn’t mean that it will definitely come to all of those carriers but its predecessor came to nearly every carrier in the United States, so I wouldn’t be surprised to see it land on multiple carriers. 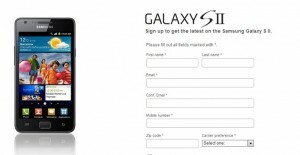 The signup page also has the standard image we’ve grown accustomed to for the Samsung Galaxy S II and seems to have the QWERTY-keyboard sporting version for AT&T. Galaxy S II is one of the best phones on the market today. It has an elegant design with lots of horsepower.